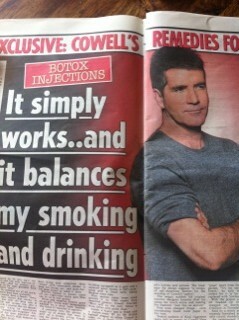 Simon Cowell is said to demand Botox Injections every 6 months, regular colonic irrigation and regular intravenous vitamin injections. Lots of other revelations like massages, chest waxes, tooth caps and dyeing his hair dark, along with taking a saucer full of tablets each morning are also going to made in a new book, Sweet Revenge: The Intimate Life of Simon Cowell, by Tom Bower, which is to be published on Friday. Sounds like a normal customer to me…..